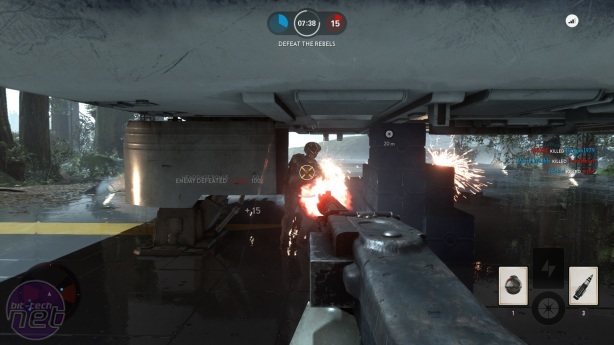 A short time ago in a galaxy that's...well...this one, Rick and Jake put away their lightsabers for a civilised chat about DICE's latest multiplayer shooter, Star Wars: Battlefront. They discuss their respective Star Wars histories, how to crash an X-Wing, and whether being Darth Vader is as cool as it sounds. Rick: It's Star Wars season! Jake, are you excited for the Star Wars season? Do you Star Wars? Are you Star Wars? Jake: I want to see the movie but I haven’t queued in the cold for midnight IMAX showings, does this count? Am I starry enough? Rick: I should imagine I'm a pretty typical example of a Star Wars fan. I love the original trilogy like children, while the only reason I accept the existence of the prequels is due to Red Letter Media's excellent Plinkett reviews of them. And I am cautiously excited for the new film. Jake: If I’m honest, I was never really bitten by the bug growing up. But I fell into it with many excellent Star Wars games - Jedi Knight, Dark Forces, Masters of Teräs Käsi. Rick: I never played Teräs Käsi but I love all of the Dark Forces/Jedi Knight games. Especially Jedi Knight II, which is the best melee combat game of all time. Vwum! etc. And I remember being tremendously excited for Star Wars: Galaxies, although when it actually released I only played it on and off for a few months. 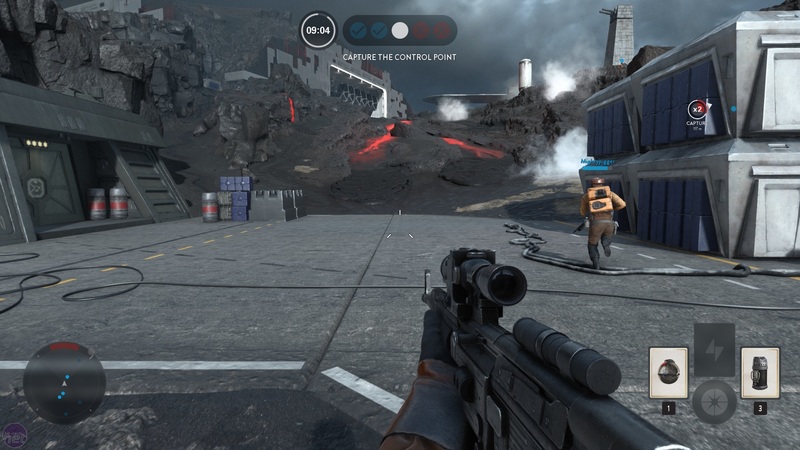 Jake: I played a lot of Galaxies and the original Battlefront with friends. After that I kind of got into the movies from there. Rick: That makes sense in a way, given there are arguably more decent Star Wars games than there are Star Wars films. 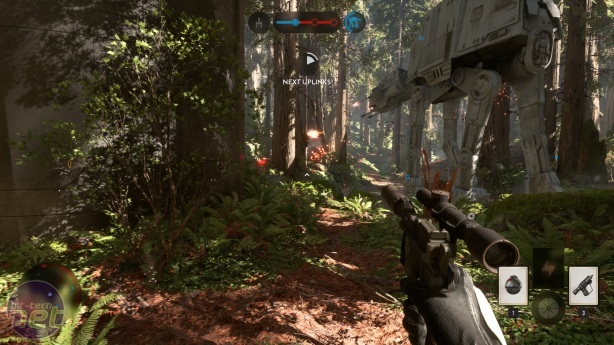 In that case, how did you feel about this new Battlefront when it was announced? Jake: Incredibly excited. Beyond excited. I think I whooped. Rick: See, I never played Battlefront, but I was intrigued because it's developed by DICE, who of course are the purveyors of ridiculous military shootybangs in the form of Battlefield. 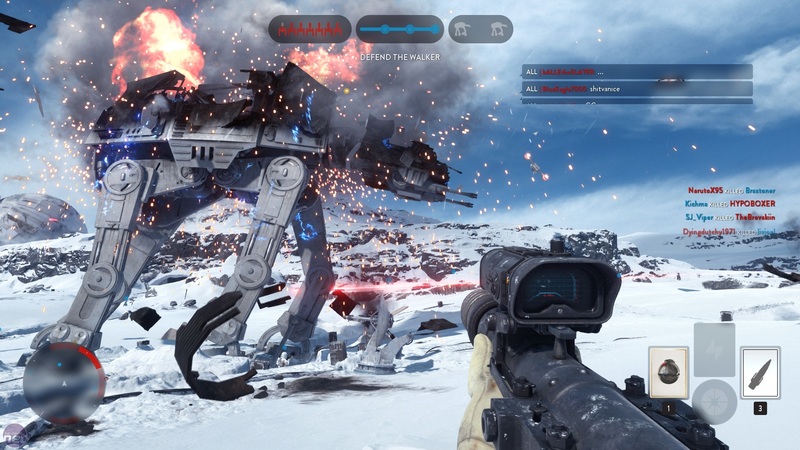 They can do large-scale multiplayer FPS like few others, so handing them a license to play with Star Wars with made perfect sense. Jake: Yeah - I had no concerns. I played and enjoyed a lot of Battlefield games, too. Rick: But now that you've played it, I gather from your review that you feel somewhat differently? Jake: I feel like the hype train has derailed. Rick: I played the open beta that EA did last month, and overall I was impressed. But my main concern was that it would be too simple, and it appears that problem runs much deeper than even I anticipated. Jake: Yeah, I hadn’t played before launch, except at a very brief hands on at EGX this year. Rick: Weirdly though, I'm still kind of glad that I played it, and even now while I'm talking about it, there's a part of my brain that wants to jump back in and blast some rebel scum. The first hour with it is enormously enjoyable, if just for the "Ooh look how pretty it OOOH that TIE fighter just explode-OOOOOOOH DARTH VADER!" feel. Rick: Ah, this is interesting. What platform did you play it on? Rick: How did you find controlling ships and fighters etc? Jake: It was super smooth. I mean, the flying feels really weird because it’s tied to one viewpoint. But everyone has that problem. Rick: I played it on PC, and using keyboard and mouse at least I found the ships almost impossible to control. Like, every time I picked one up it was like "Wow! An X-wi-" *BOOM - KILLED BY YOURSELF*. Jake: Is this in normal? Because in the normal modes it’s a disaster. The areas to fly around in are way too small. Rick: Yeah, I was speaking generally, rather than specifically about Fighter Squadron. Jake: Oh. They’re useless outside of Fighter Squadron, although I did manage to bring down an AT-AT with a tow cable to win the game. There was cheering.